METAL ALLEGIANCE have released their first official music video for the single “Dying Song” from their upcoming self-titled album. The video can be seen on KNAC.COM right HERE. The concept video was directed by Vicente Cordero of Industrialism Films. “Dying Song” features Philip H. Anselmo on vocals, Alex Skolnick on guitars, Mark Menghi on bass and Mike Portnoy on drums. “It's always my pleasure to jam with such esteemed musicians and brothers, and my contribution to this project is further proof of that fact. Hail to all Heavy Metalers the world over!" states vocalist Phil Anselmo. The debut album will be available worldwide on Spetember 18th via Nuclear Blast Entertainment. Fans who pre-order the album digitally via iTunes at http://nblast.de/MetalAllegianceIT will receive instant downloads of “Dying Song” and the recently released track, “Can’t Kill The Devil”. The self-titled album contains appearances by Philip H. Anselmo, Charlie Benante, Chuck Billy, D. Randall Blythe, Rex Brown, Ron “Bumblefoot” Thal, Phil Demmel, David Ellefson, Alissa White-Gluz, Matthew K. Heafy, Gary Holt, Jamey Jasta, Chris Jericho, Andreas Kisser, Misha Mansoor, Mark Osegueda, Tim “Ripper” Owens, dUg Pinnick, Mike Portnoy, Troy Sanders, Cristina Scabbia, Alex Skolnick, Steve “Zetro” Souza and Ben Weinman. The standard edition CD of Metal Allegiance will feature the 9 original songs. A digipak edition will be available that features an all-star tribute to Ronnie James Dio with a cover of his classic song “We Rock” as well as a 45 minute behind-the-scenes documentary on the making of the album. A double vinyl version will also be available that will feature all 10 songs. Physical CD bundles are available via the Nuclear Blast store at http://nblast.de/MetalAllegianceNB. METAL ALLEGIANCE recently announced that they will be having a record release concert on September 17th in New York City at the Best Buy Theater. The show, presented by D’Addario, will feature the following confirmed participants: Frank Bello (Anthrax), Charlie Benante (Anthrax), Chuck Billy (Testament), David Ellefson (Metal Allegiance/Megadeth), Alissa White-Gluz (Arch Enemy), Gary Holt (Slayer/Exodus), Scott Ian (Anthrax), Mark Menghi (Metal Allegiance), Mark Osegueda (Death Angel), Mike Portnoy (Metal Allegiance/The Winery Dogs), Troy Sanders (Mastodon), Alex Skolnick (Metal Allegiance/Testament), along with a few special guests. SPACE BORN KILLERS have been tapped to open the show. Tickets for the show are $25.00 and can be purchased via Axs.com right HERE. METAL ALLEGIANCE will be airing weekly webisodes every Wednesday up until the album’s release date. 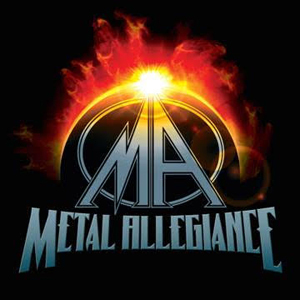 The webisodes offer fans an inside look at the creation of METAL ALLEGIANCE and the unique collaboration by hard rock and heavy metal’s most notable performers. Seven webisodes have been released in total and can be seen at https://www.youtube.com/channel/UCt-YVDXx-aEqwiPHkopZABg. This week’s episode offers a behind the scenes look at “Wait Until Tomorrow”.